Happy Kitchen Sink Stamps Monday thanks for stopping by, I hope you had a good weekend! The weather was nice here, we spent a little time outside getting the yard ready for Spring planting. 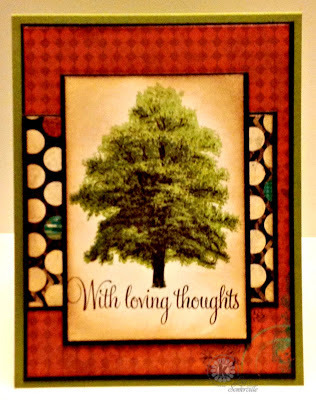 I just love the Multi Step Trees from Kitchen Sink Stamps, they remind me of my trees right now as the leaves are starting to come in. I used the Multi Step Trees along with Kitchen Sink Stamps Words of Comfort and Joy to created a CAS sympathy card. Great card, glad to hear you had some nice weather there...it has been crummy here.